In August, I judged my 30th KCBS BBQ contest and passed my online exam. After 11 years, I finally became a Master CBJ. It was time to go back to cooking and I found myself at Dana Point at bit rusty after the break. I did well enough in the dessert category to make a run for the CBBQA Dessert Team of the Year, though cooking four contests this year wouldn’t lift me out of the TOY basement. To do well regionally, you had to cook at least a dozen contests, if not more. If you wanted to be recognized nationally, you generally had to cook 30+ contests. It was a relief in a few aspects. Now in my 4th year on the circuit, I knew most teams and felt at home. Since I wasn’t competing for any yearlong standings, I felt free to cook as I pleased. I tried chicken wings, chicken breasts, and cooked on one smoker or two. I remember how tickled Harry was last year smoking on his tiny converted tamale pot at Lancaster. 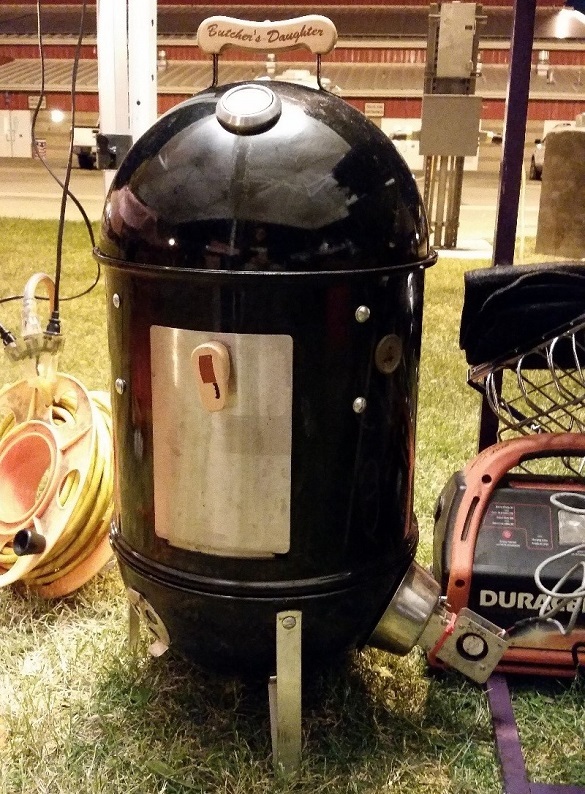 The customized smoker was converted by Kris Almquist of Karnivarous from Arizona. The fact that Harry walked in several categories only delighted him more. So I thought why not give it a shot? Harry purchased a 14.5 “ WSM for me earlier this year and I’ve been cooking on it, enjoying its simplicity, size and smooth ride. In my opinion, it holds temperature more consistently than its larger counterparts (18.5” and 22.5”). Without much to lose, I decided to challenge Harry to a mini cooking duel, his tamale pot against my mini WSM at Lancaster. My 14.5 inch WSM with custom handles made by Marty Leach and Stoker fan attachment. If he could cook all four KCBS meats (chicken, ribs, pork shoulder and beef brisket) on one small smoker, so could I. Never mind that I’ve never actually done so before or even bothered to practice once before the contest. Honestly, I was flying by the seat of my pants, an unusual maneuver for me. Since I was already unprepared, I thought I would increase the stakes by committing myself to using only his recently revamped new and improved line of Slap Yo Daddy BBQ rubs released in October 2014 (in Chicken, Beef, and All Purpose), tossing aside the multitude of rubs I had been painstakingly layering on for a year now. I had not tasted or tried any of his new rubs. 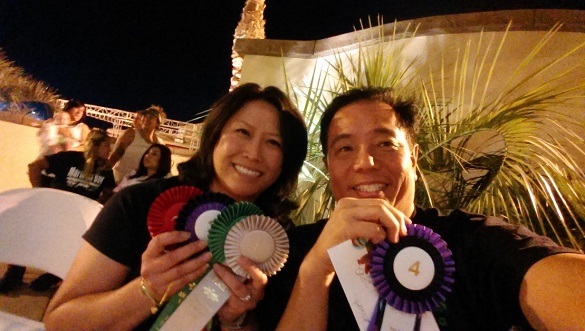 Lastly, I entered the dessert competition and the salsa side categories. I’ve never made a salsa before but tasted a version I enjoyed a couple of weeks before the contest. I asked for the recipe and my co-worker was willing to share. Again, I never practiced the salsa, but bought the best ingredients I could at the best grocery store I know of, the famous Berkeley Bowl. For the dessert combination, my daughter and I have been entering our lemon cheesecake all year long. We took 1st place at the Oaktown Throwdown, scoring a perfect 180 and then 6th place at Dana Point. Since the dessert TOY only includes the best of three contests, I need another contest to move up in points. However, my daughter was going to be with her Dad for his birthday while I was at Lancaster. I was going to have to do the preparation at Lancaster on my own. After we baked the cake at home, my daughter took a cue from all of the good pitching coaches in baseball. Knowing I was a good player who always relied on her to present the dessert, she walked up to me, looked me in the eye, put her right hand on my left shoulder and told me what to do line by line. Failure, in our household, is measured by beating or losing to Harry. This was especially true when it came to dessert because the competition is actually between my 10 year old and him. Miranda prides herself as a baker in the household. 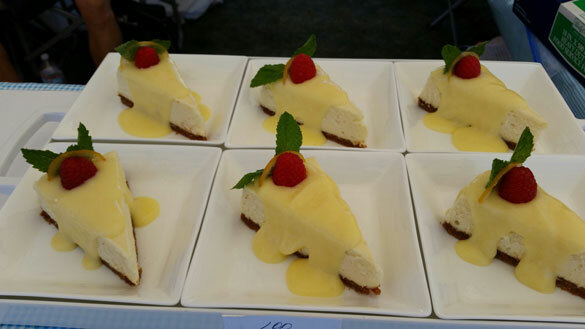 The lemon cheesecake developed from a time my daughter had with my brother, who was generous enough one day to cook a recipe with her while I was busy doing something else. It turned out so good that we decided to enter it in a contest. We’ve enjoyed perfecting it ever since. Harry’s two 18.5 inch WSM and customized 14 inch tamale pot from Kris Almquist. At 4pm Friday, Harry picked me up at Burbank airport and loaded my suitcases full of BBQ artillery into his Honda Odyssey minivan. When we got to Lancaster, he handed me three brand spanking bottles of his new rubs and instructed me on how they should be applied to competition meats. Use a generous amount of the “Jailbird” chicken rub on the thighs. 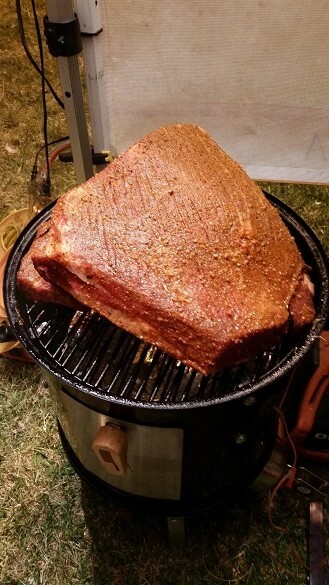 Use the “Love Meat Tender “All-purpose for the pork butts and ribs, and the “Moo-la” for the beef brisket. I also took his advice and sprinkled some chicken rub on the meat side of the ribs for flavor and color. 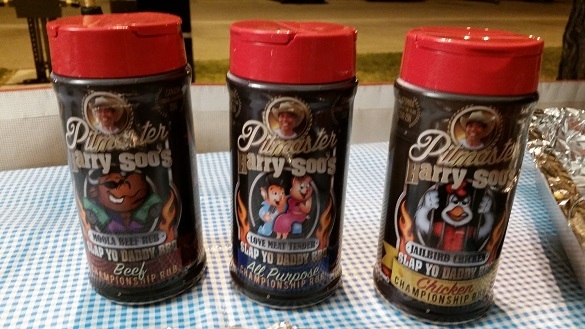 The new Slap Yo’ Daddy line of rubs released in October 2014. Having not tasted the level of salt in each rub, I asked him to tell me if I applied too much or too little rub. Harry gave me his manufacturer’s advice as Danielle Dimovski of Diva Q walked up to Harry’s tent and gave him a hug. They had met years ago at various national events and had cooked against each other at contests. When Harry was on TLC’s Pitmasters Season One, Danielle had interviewed him for her blog. Diva Q gets around but I’ve never seen her without a film crew. We had run into her at the Royal two years ago but she was busy filming. I stood quietly on the side, as they greeted each other briefly. In the stillness of Friday night, it was nice to talk before the responsibilities of cooking weighed on us the next day. For anyone cooking solo, like we were, there isn’t much time one can walk away and socialize. There’s so much to do. So a visit from a cook is as much a gift to me as a bottle of wine. 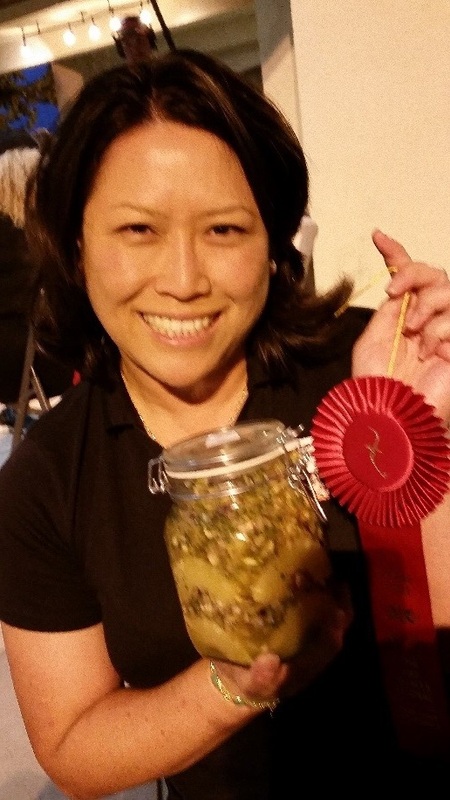 Danielle was like any typical female pitmaster I know: confident, smart and appreciative. She asked if it was okay with us to send her cameraman, Andy, over the next day to interview us. We agreed. Secretly, I hoped I would be left out completely as I am more comfortable in front of a computer screen than a camera. I put my brisket on the top of the mini rack to test it for size. Diva Q admired the challenge and said she wished she had her camera. Our neighbor and friend, Steve Botkin of Desperado BBQ came over and joked about losing his assistant to Diva Q. Ed Williams of Thank the Lard was one of Steve’s two assistants, who had over-heard Danielle say that she had to turn-in her own boxes. Ed volunteered for the task and Danielle took him up on the offer. For the rest of the contest, all of us teased poor Ed relentlessly for leaving Desperado behind. We had great fun as Ed is just about the most humble, “easy-target” kind of guy you can find. He didn’t seem to care much, as he showed up at the end of the day wearing a Diva Q hat. We teased him about that too. A 19 lb. choice certified Angus Beef brisket from Restaurant Depot. I started cooking about an hour later that night, a bit earlier than usual as I had two very large cuts of brisket (19lb) and shoulder (11lb). We were also 2300ft elevation so I adjusted my cooking time by +10%. As Harry described it, the rule-of-thumb he uses was 10% more time for each 1,000 feet increment when you’re above 2,000 feet. What I discovered was that 30lbs of meat in my smoker filled it from the bottom rack, all of the way to the top of lid. I was glad that I had brought my Stoker with me to control the temperature and that I remembered to bring my customized welding blanket that I made earlier in the year. I gave one to my buddy, Steve Aguilar of Vicious Smoke, who had his mini last year in Lancaster. The little thing churned and pushed to 275°F when I put in the brisket. But when the pork shoulder went in, it choked down and remained at 214°F longer than I was comfortable with. I wrapped the blanket around it and up the temperature went. As a matter of fact, it soared to 325°F so I removed the blanket. Then it dropped perilously down again. I finally found a good position that kept the smoker at the temperature I wanted but I lost some sleep over the fluctuations. It was at that point, I realized I should have used a 10cfm fan rather than the puny 5cfm for this job. It just didn’t occur to me that I would need it. As any good pitmaster, I adjusted to the situation by covering only half the barrel of the WSM-14 with the blanket and was thankful it remained consistent into the morning hours. I had to add in fuel more often than normal because the water pan dipped down so low that it prevented me from over-stacking the Kingsford briquettes and extending my fuel loads. Before sunrise, my heavy meats were done. I smiled at the unctuous dark patina that had developed overnight. I hadn’t seen such a pretty crust since I was in Chicago earlier that summer. I attributed the beautiful mahogany oily-looking crust to using Harry’s rub combined with the benefits of a smaller cooker. As one decreases the volume of a cooker and increases the size of the meats, the chamber becomes more humid, creating a better smoke ring and deeper crust. I had artificially produced a moist Chicago environment in the middle of the LA desert. Turns out, my friend, Bill Keyes, had already theorized the outcome the evening before when he asked about me cooking on a mini WSM. Pitmasters are a smart bunch. Scientist or not, we are always thinking about what’s happening in our pits and experimenting with formulas. 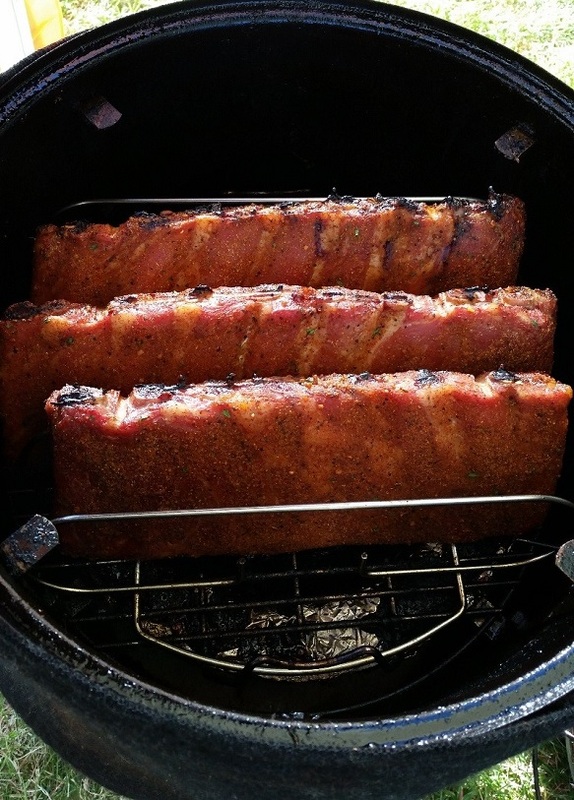 Three racks of pork spareribs in tight fitting rib rack. By mid-morning, the chicken thighs joined my three racks of ribs. As soon as that happened, the temperature dropped by 50 degrees and my Little Engine That Could fan couldn’t blow hard enough. There was too much thermal mass inside my cooker? It wasn’t any more than the night before. So I opened up the tiny door, and peeked into the fire ring below and though there was enough coals, they were covered in ash. There wasn’t enough oxygen exposure to keep the temperatures up. I couldn’t throw out the ash as we didn’t have an ash bucket so I added hot coals and prayed for the best. I also considered removing some of my meat to decrease the thermal mass, but thought I could recover in time knowing that I gave myself some wiggle room on the schedule. 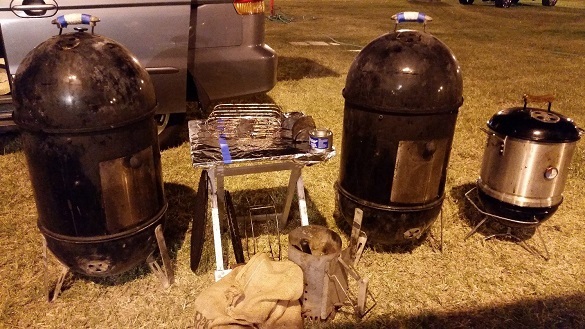 Besides, I was cooking with less meat in my smoker than anyone else at the contest. I didn’t have much room for error as was. 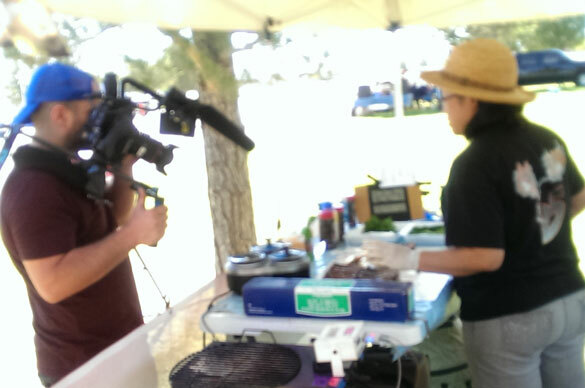 As I was worrying about my meat, Andy, the cameraman came to our tent and started filming. He asked questions politely, trying not be too intrusive. After a while, he walked over to my tent, eager to film me at work and then Sylvie Curry, a Grand Champion pitmaster hailing from North San Diego. I cringed inside but smiled outwardly. I tried to treat the camera as friend, rather than acknowledge its representation as millions of North Americans someday. Argh, I wasn’t good at this. As noon approached, I stared at the clock, just waiting. I put on some lotion and drank water to keep hydrated. My parsley wilted. I sprayed and sprayed. I pulled the chicken and took a hot bite. To my relief the thighs were juicy and not raw. I set the sauce and waited as long as I could before turning in the box. Finally, Andy was done filming us. He moved across the street to Sylvie Curry, head cook of Lady of Q. Sylvie was on a red hot streak, taking 3rd place at the prestigious Dana Point contest only two weeks earlier. I told Andy that she would be far too humble to brag about herself so I did the bragging for her up front. Naturally, I was proud of my BBQ sister. With only 30 teams, turn-ins are not far away. I passed Ed Williams inside the building who was standing still for some reason, not turning in Diva Q’s beautiful box just 10 feet away. He had a cameraman, a sound guy and the producer standing in front of him with a Go-Pro camera strapped to his chest. There was another team not turning in his box around the corner, waiting for Ed to turn in. I thought all of that was silly so I turned in my box to Kelly McIntosh, the KCBS rep, assuming it was be on the same tray as Danielle’s and just walked away. Famous or not, I thought my chicken could go head to head against anyone at the contest. Little did I know at the time, the chicken box to fear belonged to Benny Aduato of Funtime BBQ, who scored a perfect 180, beating us all. I walked back to my tent, only to fuss over my still hardened ribs, and wondered how long I could wait before I would turn them in. At least the temperature was back up and I had pulled out the chicken so the fire had less to fight inside. I had 15 minutes to wait so I took my bathroom break and passed by Kim and Ryan Moore of Knock UR Sox Off BBQ. When the time came, I pulled the ribs and sliced them up and put in what I could. I didn’t know if they were done or not but with so few ribs cooked, I didn’t have much choice. I turned in the pork and brisket entries and then worked on the cheesecake. I was a bit nervous as I didn’t want to let my daughter down. As I sliced and assembled each piece, Harry worked on his lemon pound cake in his tent. He had beaten me in the dessert contest at Dana Point two weeks prior by one meager point with an entry that my daughter and I clearly considered to be an inferior product. The candied Myer lemon slices were the best we had ever made: tart, chewy, sweet and translucent as blown glass. I hoped the judges would appreciate the hours it took for us to achieve candy perfection. My entries were quiet and muted. Harry’s entry burst into the air with pineapple stems shooting upwards and sauces dripping downwards. It was an explosion. Please dear Lord, don’t let him beat us again, I prayed. As I turned in my dessert, I ran into Ed again. This time, he was turning in some kind of berry crumble. Surrounding each ramekin was perfectly tied festival bows. I joked with Ed as he walked and gave him a complement that obviously belonged Danielle. I didn’t bother to mention a side salsa category as I’d rather not get beat by Harry at something I didn’t know anything about. Luckily, he didn’t know there was a salsa category. 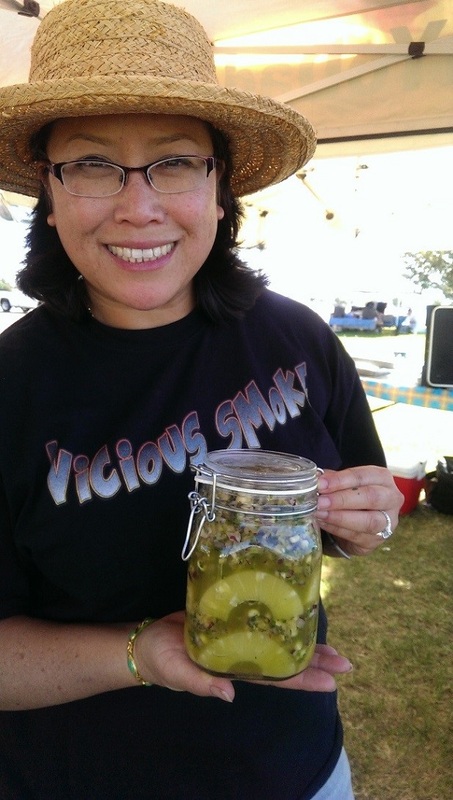 I walked over to the Grand Pavilion and stood in line with my jar of pineapple, jalapeno, corn, and cilantro salsa. My heart sank as I watched a Latino grandfather in front of me turn in a jar of pineapple mango salsa. I was certain he had been making the award winning family recipe for decades. I turned in my meager offering and let it go. The judges started flowing out of the judging area and walked over to great us. I handed out small slices of our dessert to the judges and our neighbors, making sure that Danielle and Sylvie and got their fair share. We, solo ladies had worked hard and needed a sweet break. There were four aspects to Lancaster that made it easier than most contests. It had clean, warm bathrooms. The spots were grassy, very large and flat. You could come and go as you pleased in your car as many times as you wanted. Lastly, there was a centralized area for washing your dishes. It was only the second time this year I had the luxury of washing my own dishes this year. Dishwashing is a great excuse to talk with fellow pitmasters while you accomplish a chore. I took the opportunity to meet a new cook and to catch up with Pam Wilson who gave me advice on the caring of a succulent she gave me at Pechanga Casino this summer. I cleaned myself up before awards ceremony and wore a Butcher’s Daughter shirt instead of the Vicious Smoke t-shirt I had received from my friend Steve earlier in the year. In California, it is common to wear your competitor’s shirt at a contest. It exemplifies the friendly nature of our contests. The salsa contest got a bit overwhelmed with more entries than predicted. It pushed the BBQ awards back by 20 minutes. Too lazy to bring our own chairs, Ed generously offered to me his chair until Harry found a couple more. 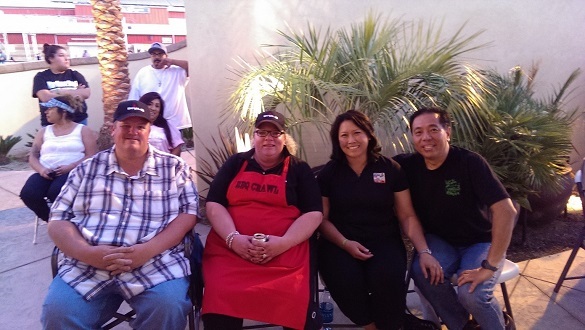 We all sat down together with Steve from Desparado BBQ. Not knowing that Diva Q’s producer was in front of us with two reserved chairs, Danielle came over and pulled her seat next to me. I tried to get out of the way and let Harry sit in my seat but he didn’t want to separate out the ladies. I smiled nervously as the cameraman and the sound guy pointed devices at us as we conversed. We managed to get so boring that even they gave up. I looked at her and told her how exhausted I was and didn’t know how she could exert enough energy for the audience. All the long hours of cooking, competing, cleaning,and talking on camera the past two days didn’t phase her one bit. What a professional! The cool October weather justified a black Irish linen shirt for Kelly McIntosh, who looked handsome as he announced the winners. I prayed that cooking on the mini didn’t hand me too much of a disadvantage. As the awards began, the TV producer asked Danielle to move up further for better lighting. She moved two chairs in front of us and Ed, somewhat embarrassed, sat down next to Danielle as requested. I sighed in relief and enjoyed the rest of the ceremony with Harry beside me. 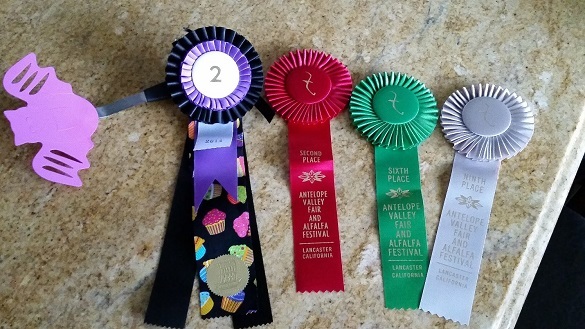 I accepted an award for 2nd place in the fruit salsa category, a 6th place in chicken and a 9th place in ribs. I didn’t hear my name for pork or brisket but then came the dessert category. They announced the top 4 winners, which was tough. Harry won 4th and I sat quiet. 3rd was Ardith Richardson, of All Hogs Go Sauced Up, the undisputed queen of the lemon squares. When they announced my name for 2nd, I jumped up from my seat and screamed in bloody delight. It was more than enough for me. Danielle came in 1st place with a perfect 180 score and she was plenty excited too. As you are far too humble to point it out yourself, congratulations to both you and Miranda on being named the 2014 California BBQ Association Team of the Year for Dessert. Thank you Scott! That is very kind of you to mention. At the time, what mattered most was to NOT repeat what happened at Dana Point (lose to Harry)! I wouldn’t hear the end of it I’m sure from my daughter if that was the case. Smiles.